Just when you think you know it all something comes along that you’ve never heard about, not even thought about. That’s what happened to me this winter on the Upper Mississippi River when I was fishing Pool 2. I was introduced to the tumble rig. We were fishing near a power plant with a warm water discharge. Typically that’s where you find a lot of fish in a small area, and that’s exactly what we found. But, even though we were catching fish, the bite wasn’t anything close to what we expected. That’s when the fellow I was fishing with said we should try a tumble rig. Somewhat embarrassed, I told him I didn’t know what that was and probably didn’t have the tackle to rig one. No problem, he had what we needed. The idea was to fish suckers, a swimbait or a plastic minnow on a live line but make them look dead. All you really do is hook them, cast them out and let them tumble along the bottom with the current. It was amazing! We immediately started catching more fish and bigger fish. Honestly, I can’t remember a fishing day turning around so quickly with only a change of bait. We fished in a fairly strong current but I’m thinking it’ll work just as well in a reservoir or when the wind is making current. If the current isn’t strong enough to move the bait, you can always help it along a little. But, I mean just a little. Think natural when you fish a tumble rig. The one problem with it is that it will twist your line. But we solved that by using a VMC Spin Shot Hook. There are three models to choose from — the Neko, the Wide Gap, the Power Shot. They’ll all work depending on what bait you choose and how you hook it. Grab the one that works for you. We hooked ours in a variety of different ways. Open point worked best — nose or back — if the bottom was relatively clean. If it was covered in drift and other stuff, we Texas rigged the hook with the point skin hooked. And sometimes we just skin hooked the bait almost anywhere. We were using spinning tackle so we tried not to bury the hook too deep because it was difficult to get a good hookset that way. Our swimbait choice was a Berkley Powerbait Power Swimmer Swimbait. It looks good tumbling along and it feels natural when they bite it. We also used a traditional Berkley Powerbait Jerk Shad. 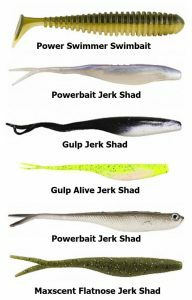 I’m thinking, though, that you could also use a Gulp Jerk Shad, a Gulp Alive Jerk Shad, a Powerbait Jerk Shad or a Powerbait Maxscent Flatnose Jerk Shad. They all look and feel natural. My rod was an Abu Garcia Ike Finesse Series Spinning rod. The 7 foot medium action and 7 foot, 6 inch medium heavy action worked best for me. 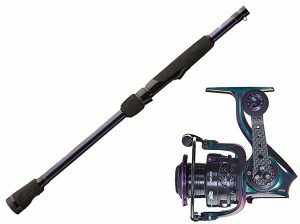 I’d suggest a 20 or 30 size Abu Garcia REVO Ike Series Spinning reel — your choice. I used both. The best line setup is 6-10-pound-test braid to fluorocarbon leader (long) or a straight fluorocarbon spool. I like the straight fluorocarbon best because I helps keep the bait down on the bottom where it needs to be to attract the better size fish. All my lines are made by Berkley, either X5 or X9 Braid or Trilene 100% Fluorocarbon. I know this sounds crazy to some of you. A dead minnow tumbling along the bottom? Really? Come on Ike? We know better. It goes against everything we know as anglers. I’ll be the first to admit that. But I’m telling you that this is a super good technique. I don’t write about anything that doesn’t catch fish. That’s not who I am, and I’m telling you this is the thing. 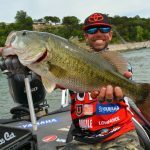 Like Ike on Facebook, and follow him on Instagram for fishing and fun content.